‘Slave Emancipation or John Bull Gulled Out of Twenty Million’, Woodcut (G. Drake, 12 Houghton Street, Clare Market, London). Image © UCL Art Collection, UCL EPC8032. 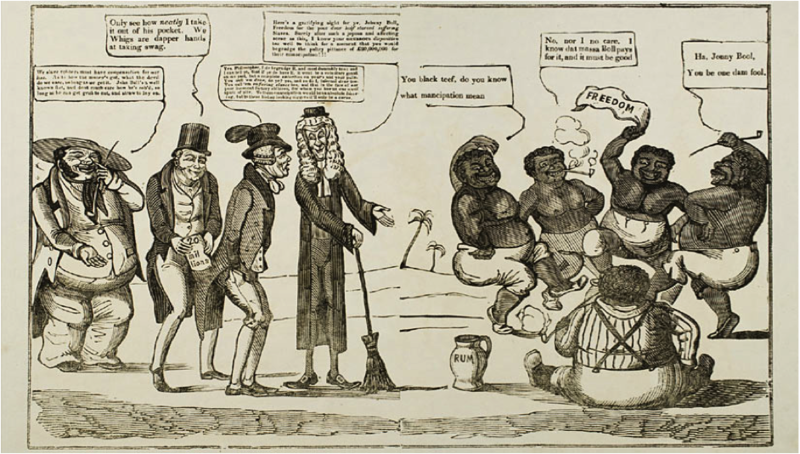 My name is Kate Donington and my PhD Studentship is attached to the ESRC funded Legacies of British Slave-ownership Project at the History Department in UCL. The Project began in September 2009 and will run until September 2012. The historians working on the project are Principal Investigator Professor Catherine Hall and Research Associates Dr. Nicholas Draper and Mr. Keith McClelland. The Project Administrators are Rachel Lang and Ben Mechen. The Project is unique in its combination of historians each with specialisms in cultural, social, political and economic history. An integrated approach to the treatment of history has been vital to the project. Alongside the historians working on the database, the Project has a debt of gratitude to the many local and family historians who have generously contributed to, and enriched it. It has been a truly collaborative project which has engaged with groups both nationally and internationally through the communication networks facilitated by Rachel and Ben, its regional workshops and an international conference. An open access online encyclopaedia of slave-ownership will be made available in the summer of 2012 for use by researchers interested in anything from the study of slavery to family history. The Project came about following PhD research undertaken by Dr. Draper which resulted in the publication of his award winning book The Price of Emancipation: Slave-Ownership, Compensation and British Society at the End of Slavery (2010). As part of the package of measures taken by the British government to secure the abolition of slavery in the Caribbean, the Cape of Good Hope and Mauritius in 1833, compensation to the tune of £20,000,000 was paid to the slave-owners. This was largely the result of successful lobbying by a group known as the West India interest. This faction comprised of, in the main, slave and plantation owners and West India merchants. The group was further supplemented by its powerful family and friends amongst them many naval and military men, insurers, financiers, members of the House of Lords, and parts of the Royal family. Outside of the corridors of power additional influence was sought from the sugar refiners, rum distillers and the manufacturers who provided goods for the plantations. As can be seen from the image by C. J. Grant above, slave compensation was a contentious issue for a number of reasons, not all of them altruistic. It was not just the proslavery lobby who agreed that slave compensation should be paid – the abolitionists were divided on the issue. Enslaved people were defined in law as the chattel property of the slave-owners. During the period of abolition (1787-1838) property was held in almost sacred regard; an attack on property for many recalled the anarchy and violence of that great epoch definer, the French Revolution. Using the example of compulsory purchase orders made to facilitate for example, the building of the West India Docks, the slave-owners campaigned for and eventually received the staggering sum of £20,000,000 alongside an agreement that the enslaved workers would be forced to endure a system of apprenticeship before being made, in their view, ‘fit for freedom’. The unpaid labour they undertook until the apprenticeship system was abandoned early in 1838, should likewise be considered as contributing towards the cost of paying for emancipation. Image © National Archives of the United Kingdom. In order to claim compensation a large scale bureaucratic system was implemented in both the colonies and in Britain. 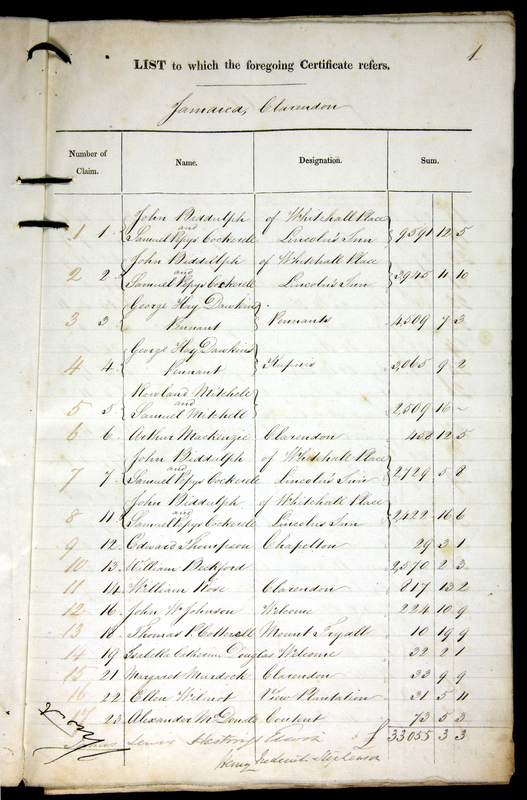 People who wished to make a claim had to register themselves; the resulting registers have been used by the Project to identify the slave-owners resident in England, Scotland and Wales in 1838. The Project has used this information to trace these individuals’ impact on the cultural, social, economic, political, imperial and physical formation of modern Britain. This has involved identifying whether or not the individual went on to have a political career in Britain. Did they become involved with colonial administration? Did they invest their money in businesses either at home or in the empire? Or did they perhaps put their money into new technologies and innovations like, for instance, the railway boom? Did they build city villas or country houses? Was their money spent on amassing collections of art or books? Were they philanthropic and if so what institutions did they found or support? Did they engage in any large or small scale public works like the building of roads, canals or docks? If they went on to become writers – what memories of slavery did they create in their narratives? It is hoped that by making this information available people will be encouraged to think about, in precise terms, what slavery meant for Britain during the period and beyond. In the next instalment of this blog you can read how this framework for analysis has been put into action through a case study of the subject of my PhD – George Hibbert M.P. (1757-1837). This entry was posted in Information and tagged Slavery. Bookmark the permalink.